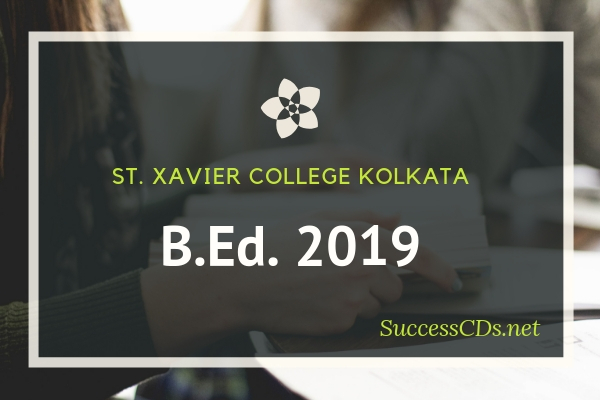 St Xavier’s College B.Ed Admission 2019 - St. Xavier's College (Autonomous), Kolkata invited applications from eligible candidates for admission to 2 years regular B.Ed. Course in St Xaviers College for the Session 2019-21. Applicant must be passed with 50% marks in Bachelors or Masters Degree for General Category and 45% for Reserved Categories. Maximum age limit is 40 years as on 1st July 2019 for freshers. Studied at least one subject offered in B.Ed. Course at St. Xavier's College (Autonomous), Kolkata either at Graduation (with at least 300 marks) or at Postgraduate level. Application Forms are to be filled in & submitted online through the College Website www.sxccal.edu from 21st February 2019 (11 am) to 12th March 2019 (01.00 pm). In cash, only to the Syndicate Bank, Park Street branch located inside the St. Xavier's College Campus through the Bank Challan generated following the successful submission of the online application. Applications for which the payment is made to any other bank/branch will not be registered by the College even if the bank/branch accepts the application fee.